Jeanne Baret, a French woman from the Loire Valley, and her lover, botanist Philibert Commerson, implemented an elaborate plot so she could join him on a French expedition around the world, led by explorer Louis Antoine de Bougainville. The credit of first American woman to circumnavigate the globe is given to Lucia Ruggles Holman – like Jeanne Baret’s, her trip around the world had its complications. The 1819 departure of the Pioneer Company of missionaries to the Islands missionary was in danger of indeterminate delay because they lacked a physician. One in the company, Samuel Ruggles, thought of Lucia, his sister, and her suitor, Thomas Holman, a physician practicing in Cooperstown, New York. If the doctor could be persuaded to join the missionary cause, events could proceed on schedule. Ruggles thought Lucia and Thomas could marry, and then he would have the company of kin on this endeavor. However, Holman, a recent graduate of Cherry Valley Medical School in New York could not marry due to the debts incurred by the doctor’s unsuccessful practice. Then, a solution appeared in the guise of becoming missionaries. On October 23, 1819, the Pioneer Company of American Protestant missionaries from the northeast US set sail on the Thaddeus for the Hawaiian Islands. Dr Thomas Holman and his wife Lucia joined two Ordained Preachers, Hiram Bingham and his wife Sybil and Asa Thurston and his wife Lucy; two Teachers, Mr. Samuel Whitney and his wife Mercy and Samuel Ruggles and his wife Mary; a Printer, Elisha Loomis and his wife Maria; and a Farmer, Daniel Chamberlain, his wife and five children. After rounding Cape Horn (the southern tip of South America) and 164-days at sea, on April 4, 1820, the Thaddeus arrived and anchored at Kailua-Kona on the Island of Hawaiʻi. Hawai‘i’s “Plymouth Rock” is about where the Kailua pier is today. Dr. Holman, contrary to the unanimous advice and request of the brethren, left them, and went to reside on the island of Maui, more than 80 miles from any of them. This they considered an abandonment of the mission. After only four months in the islands, the Holmans had not adjusted to the spirit of the mission. (Kelley) He withdrew from the mission on July 30, 1820 and returned to the US with his family (including Lucia Kamāmalu Holman born in 1821). With the impending departure of Hōkūleʻa and Hikianalia on their journey around the world “to learn, create global relationships, and explore how to care for our oceans and island earth,” (PVS) we recognize they are also following the footsteps of Hawaiʻi’s last king, Kalākaua, over a century ago in sharing the Islands with others. Leaving January 20, 1881 on the Oceanic and arriving back in the Islands October 29, 1881 (nine months and nine days later,) Kalākaua travelled to the US, Japan, China, Siam, Burma, India, Egypt, Italy, Belgium, Germany, Austria-Hungary, France, Spain, Portugal and the United Kingdom. Kalākaua wanted to gain recognition for his kingdom and learn how other monarchs ruled. He believed the best way to conclude diplomatic relations with foreign countries was to understand their customs. He met with the Emperor of Japan; General Li Hung Chang, of China; the Governor of Hong Kong, in the name of the British Queen; the King of Siam; the British Governors or Commissioners of Singapore, Penang, the Malacca Straits, and of Burma; the Vice-Regal Court of India; the Viceroy of Egypt; the King of Italy; the Pope, Holy Father in Rome; the British Queen; the King of Belgium; the Court of Emperor William of Germany; the officials of the Austrian Empire, in the absence of the Emperor; the officials of the French Republic; the officials of the Spanish Court, whose Regent was absent; the King of Portugal; and finally, the President of the United States. However, he was greeted and handled with stately attendance. He was royally entertained and decorated with the highest orders; armies were paraded before him and banquets held in his honor. One striking incident occurred while the King was being entertained by the Khedive of Egypt at Alexandria. The royal party, during the reception, was brought out on the balcony of the palace to look out over the harbor. And while they were standing there, an attaché pointed out to King Kalākaua an old hulk used for receiving coal. At the end of his trip Kalākaua declared that he had found nothing in the civilized world of which his nation stood in need with the exception of some well bred horses and sheep. He said that he found his own subjects to be better off than the majority of the nations he had visited. 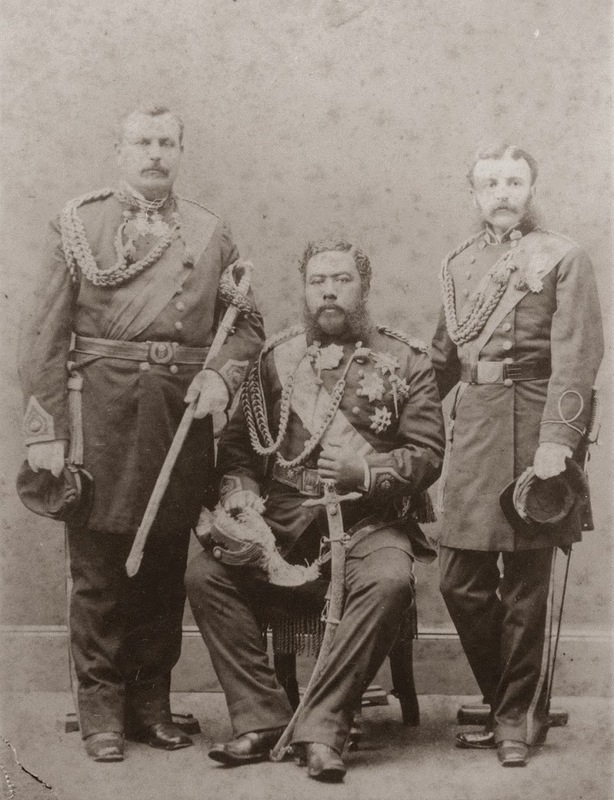 The image shows Charles H Judd, King Kalākaua and William N Armstrong during trip around the world-1881. In addition, I have included more related images in a folder of like name in the Photos section on my Facebook and Google+ pages.